Story submitted by Amey Garber. 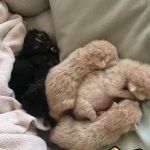 In the fall of 2016, I was told that there was a mother cat and her six (!) sick kittens in the Isolation room at Animal Care and Control. This large family needed to get out of a small cage and into a home as soon as possible. 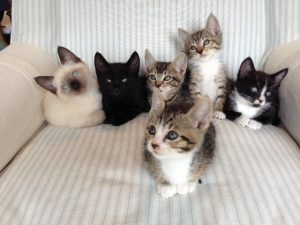 They were released to me with a complicated medication schedule for each kitten: some had eye infections and some were getting antibiotics in different dosages based on their weights, with different end dates for receiving the doses. 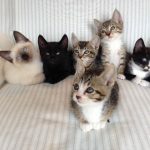 In addition, although each kitten had been checked for ringworm, when I got them home I discovered that the mother had not, and she had open sores on her chin. So that mean another trip back to the shelter to get her checked. 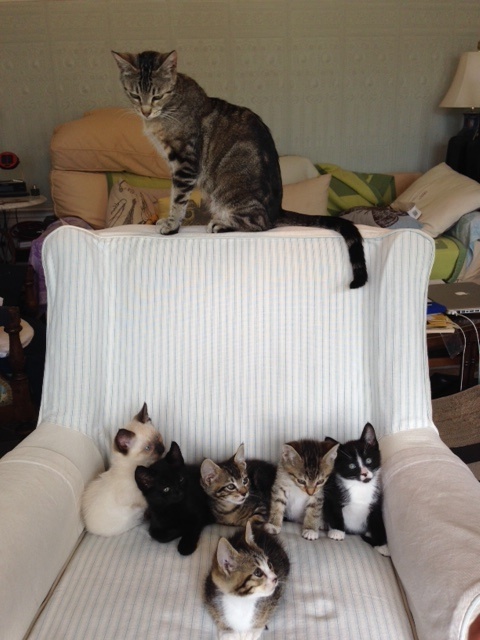 Fortunately she was also negative for ringworm, and so despite the long, anxious period of observing each kitten as he or she improved – or got sick (the ones who started out health got sick as the sicker ones got healthy), we were able to enjoy this family. The mother, whom we named Cleo because her slender (almost gaunt) physique reminded us of a classic Egyptian cat statue, was supremely attentive to her kittens, and very friendly to us. She was extremely alert about who entered the house and would come running down the hall to check us out and greet us every time we returned to the house. She seemed like she have been a good hunter, and had an active outdoor life before she was taken to the shelter, because although she was social, she also was very thin. She refused to eat anything without taking a mouthful of it and crying for the kittens to come to her, just the way mother cats do when they’re training their kittens to come see what latest prey they’ve brought home. She even would do this with a clump of wet food – she herself couldn’t eat without carrying food to them, even if that meant depositing it on the living room rug. Luckily, it has a pattern that hides cat food deposits. It also seemed like she had been a mother before. She was so constant in her care and nursing of her kittens. On the day when she the last two kittens were adopted, she was still nursing one of them in the cage in the room where they had final blood tests and microchipping before going to their new homes. Her kittens were adopted two by two, so all six kittens went to their new homes with a sibling. 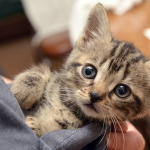 Two pairs were integrated into a home that contained an adult cat – all of the introductions went well. 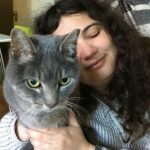 One adopter took a very slow approach in introducing the kittens to her 13-year-old cat, who had lost his brother earlier in the year. It took months of careful, limited time together, but by the end of it, the kittens and her elderly cat are very attached to each other. 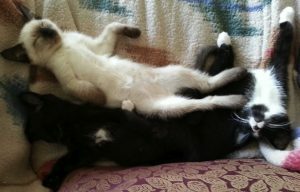 Cecil, Pippin, and Dot on a recliner upside down! 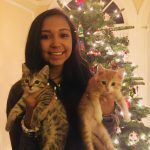 Then three months after their adoptions, we had the joy of cat and kitten sitting for her and the last two of her kittens to be adopted. They were the three who had stayed together the longest. The kittens knew her at once and by the end of their week together, they were romping with her like they’d never been separated. It was such a pleasure to see how they recognized each other and to witness their chance to visit with each other again.